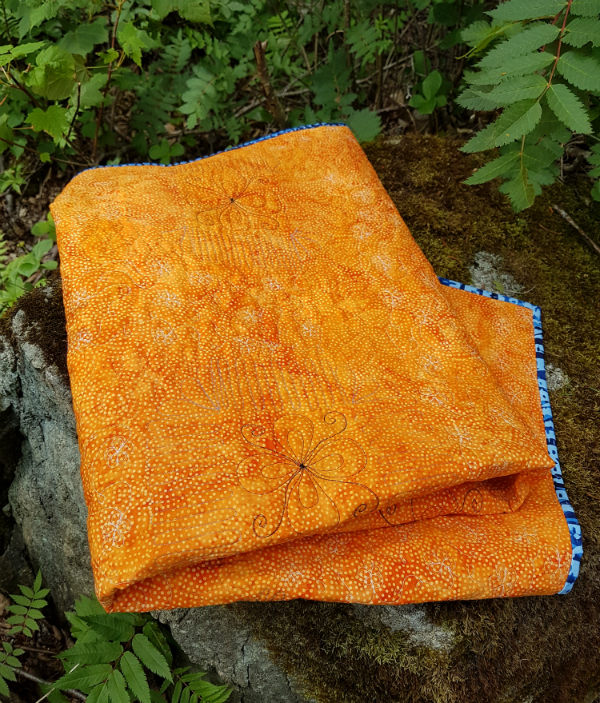 The July Island Batik ambassador challenge is to use a block that creates a secondary pattern, which was right up my alley. I love blocks that create secondary patterns! 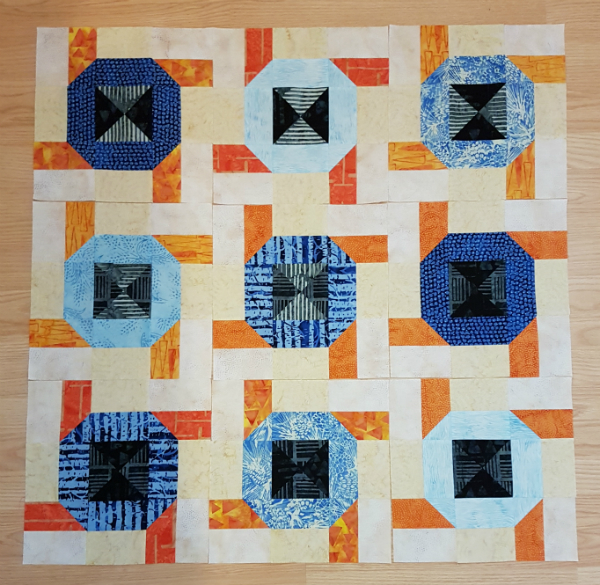 I decided to use my Connections block, which is a free tutorial from my fourth blogiversary last year. 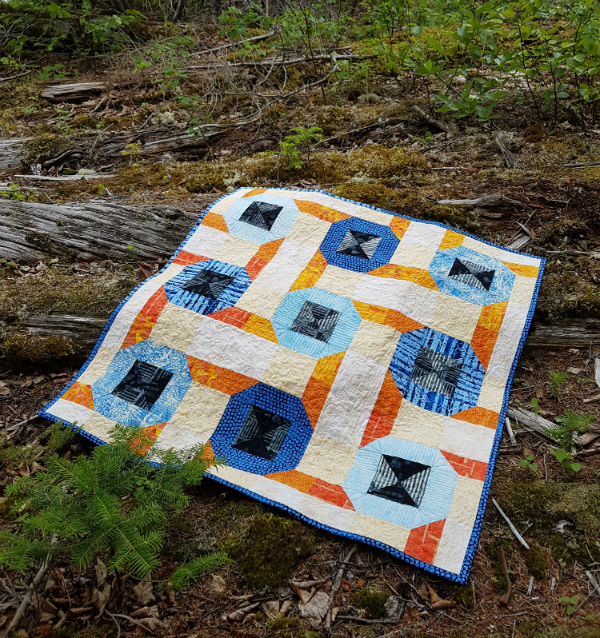 I chose these fabulous blues, blacks and oranges along with this equally fabulous cream and decided to make 9 blocks for a 36" square mini quilt. I cut my pieces before we went on our trip and even managed to piece some of the units and then left everything sitting on the kitchen table for when we got home. After we got back, I wasn't sewing long before I realized I had only cut half as many cream pieces as I needed...and I didn't have enough to cut the rest. Oops! I pulled out my remaining Buttermilk fabric and decided it was close enough. Not a close match, really, but with all the variety in the other colours, it hopefully wouldn't matter that the background is two different fabrics. Crisis averted, I pieced my 9 blocks and laid them out, only to find myself with another crisis! My blocks were decidedly lacking in secondary pattern, which, you may remember, was the entire point of this month's challenge! GAH! I had forgotten that I needed to flip some blocks, not just rotate them. Insert forehead smacking emoji here. I had the blocks all laid out on the floor as I stared at them, trying to figure out what to do, when my husband walked into the room. "Looks good," he said. Gotta love that support! I thanked him, of course, and then explained the problem, flipping over a couple of blocks to demonstrate how they were supposed to connect to create the secondary pattern. He looked at them for a few minutes and then asked if it matters which side of the fabric is up. Since these are batiks, there is no wrong side, so he pointed out that I could take the blocks apart and sew them with the seams going the other way. I'd only need to do it to 4 blocks and I wouldn't have to take everything apart, just enough to switch the direction of the blue/orange connector units. 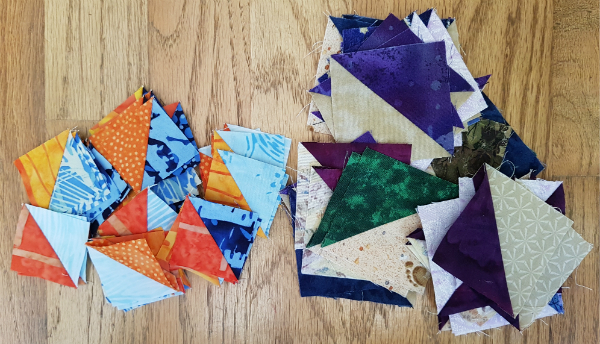 Note to self, next time you make a quilt using the Connections block, remember to flip half of the blocks so they actually connect! I used Warm and Natural batting and Aurifil thread in 2692, 4140, 2210 and 2311 and got started on the quilting. I had fun quilting each section differently, starting with the blue rings. They got simple back and forth lines, with these flourishes in the corners. 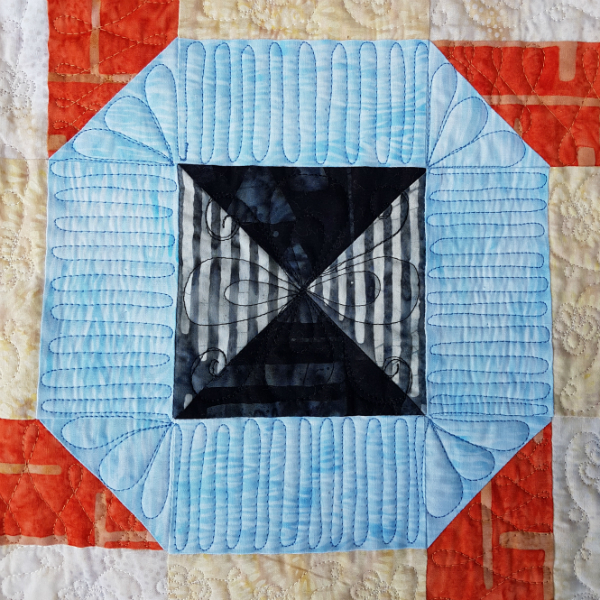 I read a post recently where a quilter (I can't remember who) said that her solution to being unable to neatly continue a motif around a corner is to do something different in the corners. Brilliant! I usually struggle to turn those corners neatly too, so this is such a great idea and it worked well here. I'll definitely use that trick again. The orange connector units got wishbone quilting. 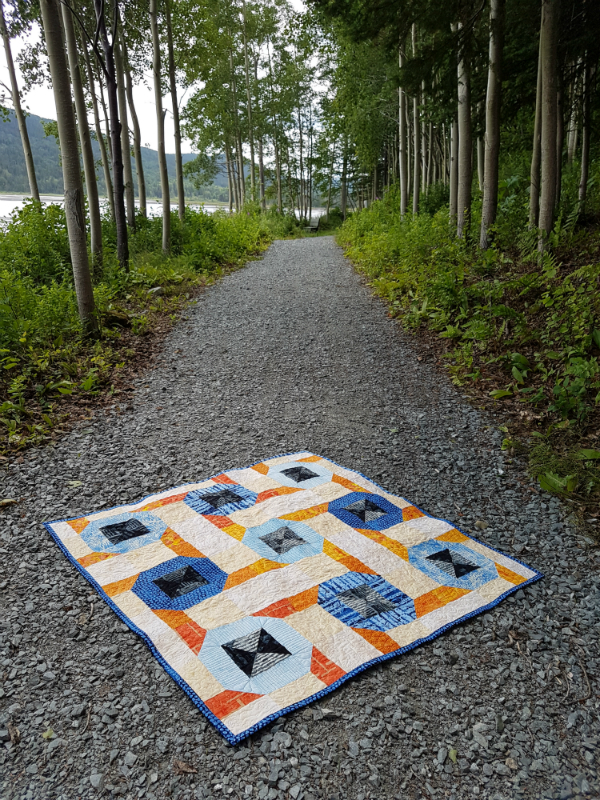 It's one of my favourite designs to quilt and it's fast, so that's a bonus. I debated for a while what to do in the black hourglass units and finally settled on this design that I found on Pinterest. It was fun and quick to stitch. That left the background sections. Everything else I had quilted was rather curvy, so I wanted to stick with that, but I didn't want anything too time consuming since the end of the month was quickly approaching. 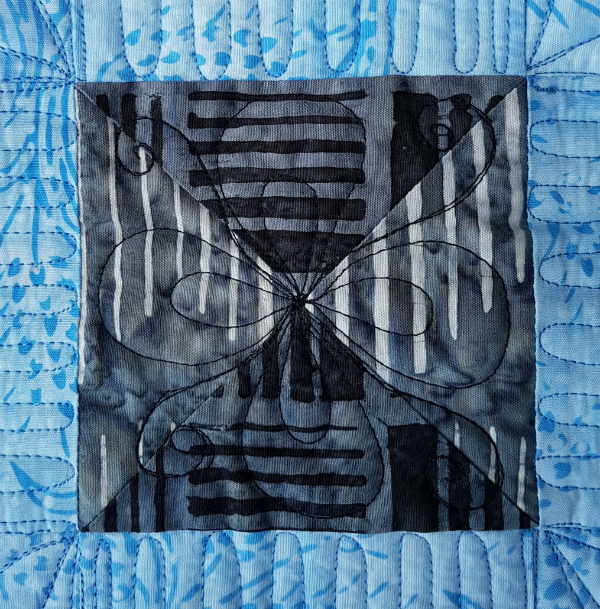 I flipped through Step by Step Free Motion Quilting, by Christina Cameli and found this design, which I loved. Just like in a field of real flowers, these quilted ones are all different sizes and their petals are all different too. And those meandering loops make me think of bumble bee trails 😊 This would make a great all-over design too, though it would have to be done at a larger scale, assuming I could make myself stitch bigger flowers. I'm thinking I might use it on my August IB challenge quilt when I get to that point, but it'll be a while since I'm only just getting started on that. As always, I love the quilting on the back! 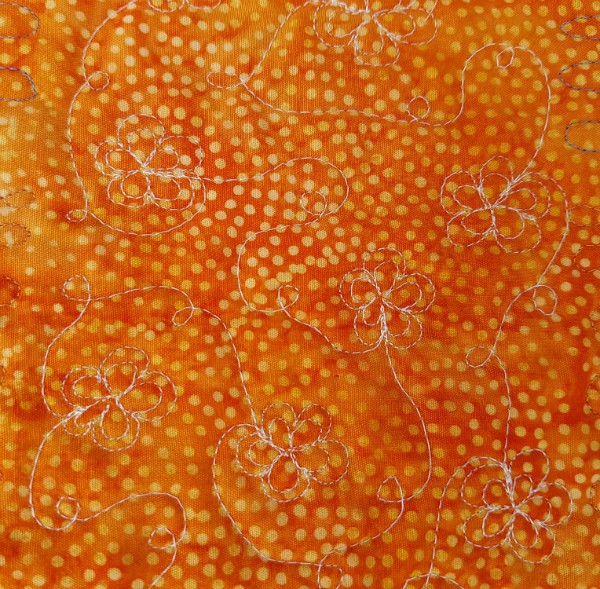 I used the orange dot batik and I love how vibrant it looks. 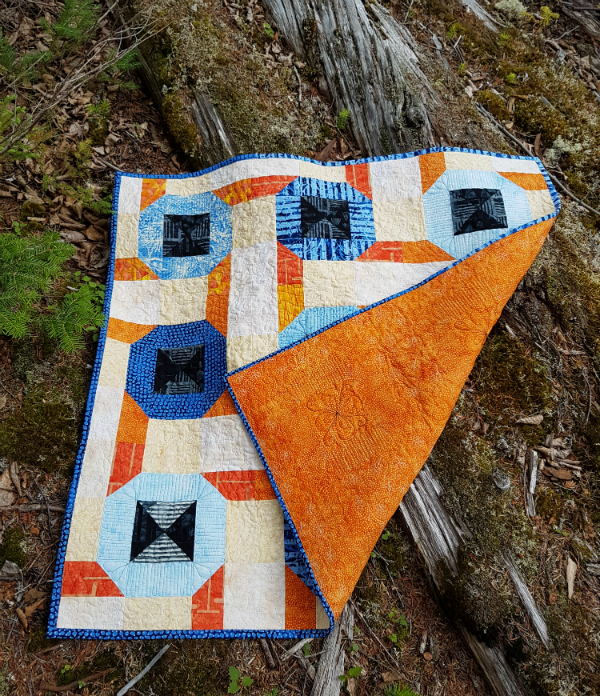 Over the last year or two, I've been drawn more and more to the combination of orange and blue, so the back of the quilt with the blue binding just sings for me. All the texture from the quilting doesn't hurt, either. Did you notice that the binding is two different blues? I didn't have enough of either one to do the whole thing, but they work perfectly together. This one is for my mom, who loves daisies! 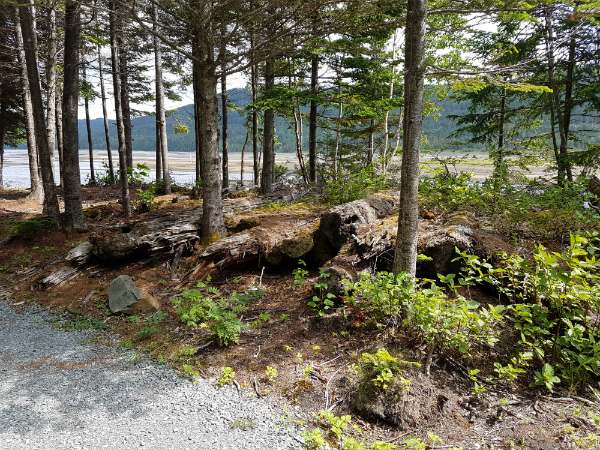 On the trail there are old logs, leftover from when the river was used to float logs to the bay back in the day. They made the perfect backdrop for some of these pictures. And they're beautiful in their own right, all covered in moss. In the process of making the 9 Connections blocks, I also made an abundance of extra HSTs. 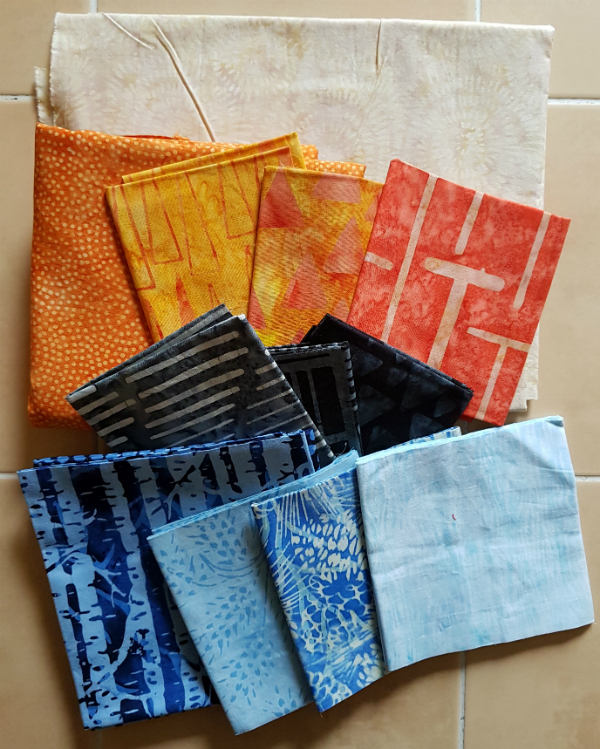 The blue/orange ones were made as bonus HSTs while I made the connector units and the random coloured ones were my leaders and enders. It was fun revisiting an old block (screw ups and all!) and I love how this little quilt turned out. Thanks once again to Island Batik for allowing me to play with these gorgeous fabrics and fun challenges each month. I am love being an Island Batik ambassador! What great colors and I love how the blocks connect and interact. 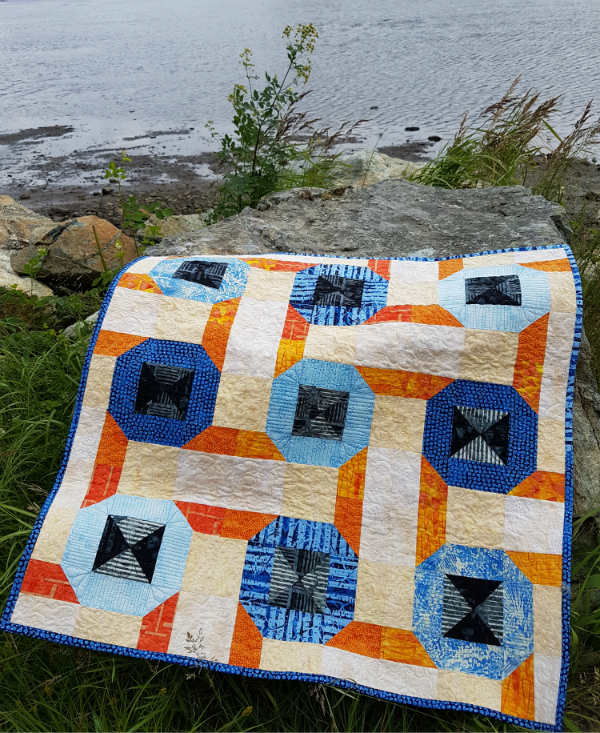 Hi Leanne: i love the combination of orange and blue, although I've used it so much I'm giving it a bit of a rest. I love your block . It's really fun and the secondary pattern just ads more to the fun. You are lucky to live in such a beautiful setting. I love this quilt. It is definitely modern looking enough for a teen. 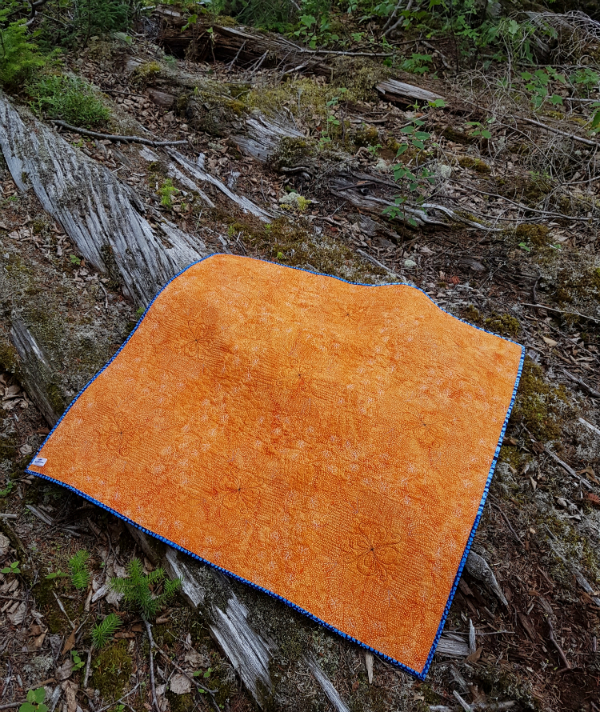 One nephew wants an orange and blue quilt. I am adding this to the list. Awesome. Great photos. The quilting suits it perfectly. So pretty! I love the secondary pattern and the orange backing too! 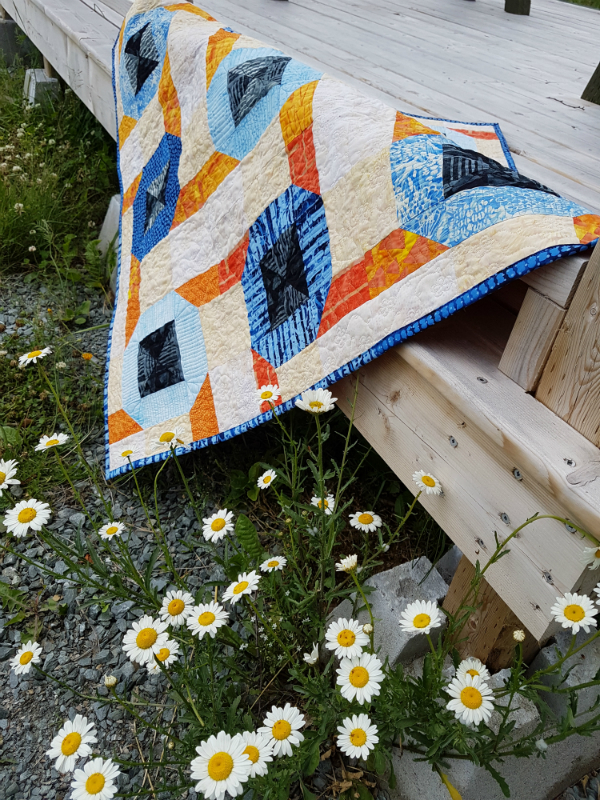 I really like this quilt and the block! I may have to make one! I was just thinking the same thing about loving being an Island Batik ambassador this morning! The challenges and having to work with the fabric they've sent and making it work are so great for the brain and creative spirit! I love what you created; yay for husbands who can help in the creativity/design departments! 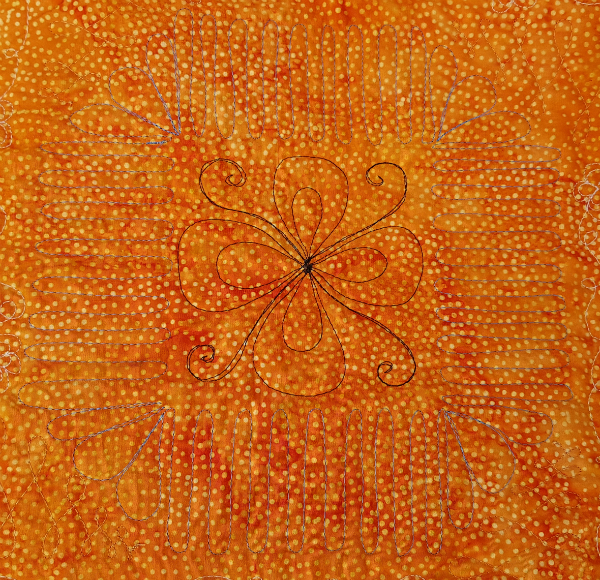 Love the quilting you did too, and yes, it may have been Angela Walters who said that, because I recall her saying that in the Dot to Dot class I took from her in Sarasota. :-) Wonderful finish, and don't you love how well their fabrics coordinate? Did not notice at all that you'd used two different blues in the binding.